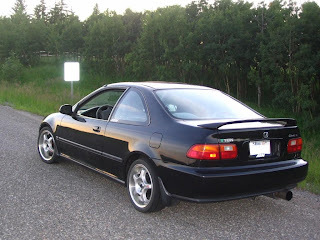 Introduced in July 1991 the fifth generation of the Honda Civic had a more wedge-shaped body and the wheelbase was increased to 257 cm (101.3 inches) for the two-door hatchback and 262 cm (103.2 inches) for the four-door sedan. The wagon was also dropped for overseas markets, while the previous generation station wagon continued in Japan. This generation of Civic used lightweight materials to create a fuel efficient economy car. 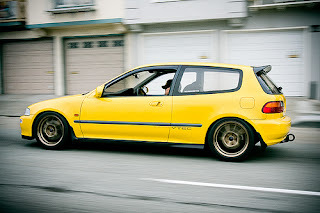 In addition, vehicles with the 1.6L SOHC VTEC 125 PS engines such as the Si hatchback and EX coupe models found in the United States, provoked popularity of the (relatively) high performance 1.6L I4 segment. 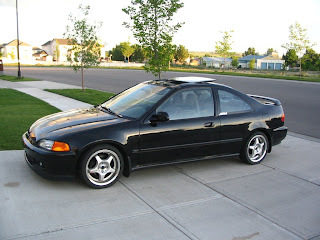 In South Africa a unique model with the B18B3 from the Acura Integra RS was specially built to fill the gap left by the absence of the DOHC B16A VTEC engine in the range. 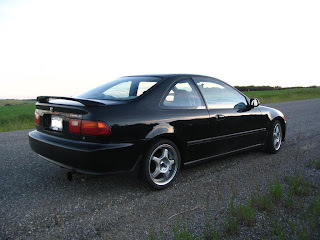 Trims available in the hatchback body style were the CX, DX, VX (EH2) and Si (EH3) initially for both the U.S. and Canada, however the VX and Si models were discontinued in Canada after 1993. With a total interior room (passenger and luggage) of 90 cu.ft., the hatchback was classified by EPA of U.S. as subcompact. CX: The economical CX was the base model equipped with all-manual features, and power brakes. It comes with a 8-valve 70 hp 1.5L engine. With 42/48 miles per gallon (mpg) (city/hwy) [revised to 2008 EPA rating: 35/43 mpg city/hwy] or 40/47 mpg (city/hwy) [revised to 2008 EPA rating: 33/42 mpg city/hwy], the CX was the second most fuel-efficient Civic model of the fifth generation, after the VX. CX models in Canada with automatic transmission came with power steering. Some CDM CX models (colloquially known as the "CX-Plus") could be ordered from the factory with a rear wiper, side mouldings and manual passenger-side mirror. VX: Fitted with only manual transmission, the VX was very similar to the base model CX but gained improved fuel efficiency through a 92 hp 1.5 LVTEC-E engine yielding 48/55 mpg (city/hwy) [revised to 2008 EPA rating: 39/49 mpg city/hwy] or 44/51 mpg (city/hwy) [revised to 2008 EPA rating: 36/46 mpg city/hwy]. In Canada, it was rated by Transport Canada fuel consumption estimate: 4.7L/100km city and 4.3L/100km hwy. Other features were an 8k tachometer, lightweight 13-inch (330 mm) aluminum alloy rims, as well as additional front & rear under-body trim additions to improve aerodynamic flow. To this day, the CX & VX models are lauded as one of the gasoline-powered cars that rival fuel economy of hybrids and diesels -- in the March 2010 issue of Car & Driver, it mentions its long-term test car, a 2009 VW TDI Jetta with 6-speed dual-clutch auto transmission, got worse fuel mileage (38 mpg) than their 1992 Honda Civic VX test car (which got 41 mpg) and 2000 Honda Insight hybrid (48 mpg). Si: The Si replaced rear drum brakes with disc, added rear speakers (beginning 1994), a power sunroof, clock, 9k tachometer, ABS (some 1994 models), wheelcovers on 14-inch (360 mm) wheels and power side mirrors (body coloured, beginning 1993), and the most powerful VTEC engine of the hatchback class at the time.DX: The more powerful DX (pictured), with a 102 hp 1.5 L engine, added an AM/FM cassette player, manual passenger side mirror, tilt steering, side mouldings, rear wiper, power steering, wheelcovers, and rear cargo shelf as standard equipment. Trims available in the USDM sedan body style were the DX, LX (EG8) and EX (EH9), while the CDM models were branded slightly differently as the LX, LX "Special Edition", EX (EG8) and the 1992-only EX-V (EH9). The USDM DX/CDM LX was the base model, and equipped with all-manual features and power brakes. The Canadian-only LX "Special Edition" added an AM/FM cassette player, wheelcovers, center armrest console, clock, power steering and dual power mirrors. The USDM LX/CDM EX included an AM/FM cassette player, cruise control, wheelcovers on 14-inch (360 mm) wheels, center armrest console, clock, tachometer, power steering, and power windows, locks and mirrors. On the USDM EX/CDM EX-V, Honda added the VTEC engine, a power sunroof, body coloured mirrors (beginning 1993), rear sway bar, ABS, upgraded stereo and deluxe wheelcovers. All DX and LX models used the D15B7 a 16 valve SOHC engine rated at 102 bhp (76 kW; 103 PS) and 98 ft·lbf (133 N·m) of torque. DX and LX models were aimed towards the economy conscious market. The USDM CX models had the D15B8 which is an 8 valve non-VTEC engine rated at 70 bhp (52 kW; 71 PS) while the CDM models came with the D15B7. The VX had the D15Z1 (VTEC-E engine) capable of 92 bhp (69 kW; 93 PS). The EX, EX-V and SI=i had the D16Z6 SOHC VTEC engine (125 hp (93 kW)). 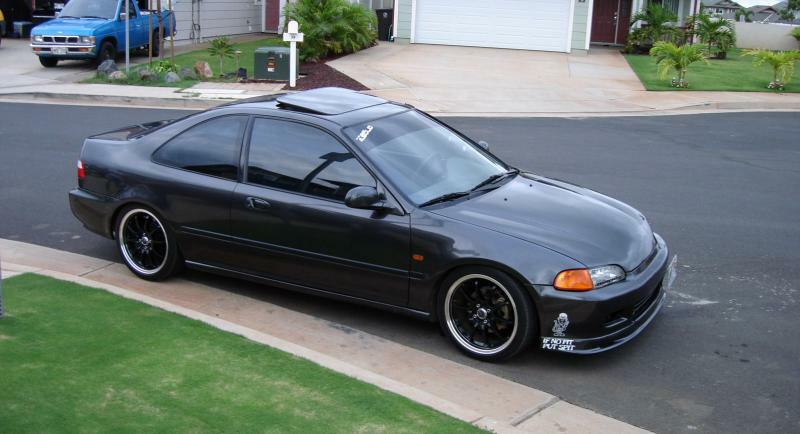 The SiR was equipped with the 1.6L B16A2 with VTEC. All weights listed in this table are in lbs. In Europe the DX had the D13B2, LSi had the D15B2 (hatchback) and D15B7 (Sedan), VEi had the D15Z1, ESi had the D16Z6 and VTi had the B16A2. D15B7 engines were available in the 1994-95 civic coupe LSi. In Japan and Europe, as well as a few other export locations, the VTi was offered in 2 motors: the B16a2/3 (160 hp DOHC VTEC) and the D15B. 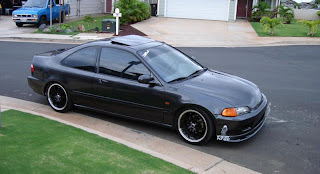 (130 hp VTEC SOHC) The D15B shares the same head as the US Civic SI (D16Z6) but a unique block, crank, and rods. the car shared the 1.5L I6 displacement of the other D15 blocks, but the rods were the same length as the B16's. Despite this, the crank and bearing sizes were not the same. In the Middle East the EX had the D16Z9 (Sedan)(EH5) and VTi (hatchback & coupe(EJ1)) had the B16A3 engine. The four-door wagon was discontinued in North America and most other export markets; in Japan the fourth-generation wagon continued to be produced without change.93) were the DX (EJ2) and EX (EJ1) for the United States Domestic Market (USDM), and the DX, DX "Special Edition" (EJ2) and Si (EJ1) for the Canadian Domestic Market (CDM). DX: The DX was the base model equipped with all-manual features, driver's side door mirror, defroster and power brakes. The Canadian-only DX "Special Edition" added an AM/FM cassette player, wheelcovers, center armrest console, clock, power steering and dual power mirrors. EX/Si: The USDM EX/CDM Si included an AM/FM cassette player and upgraded sound system, cruise control, wheelcovers on 14-inch (360 mm) wheels, clock, tachometer, power steering and dual body-coloured power mirrors, with the USDM EX also receiving power locks and windows. http://juniorservice.blogspot.com/. Tema Jendela Gambar. Diberdayakan oleh Blogger.